These economies of scale and network effects can be so significant that they outweigh the more traditional theory of comparative advantage. In some industries, two countries may have no discernible differences in opportunity cost at a particular point in time. But, if one country specialises in a particular industry then it may gain economies of scale and other network benefits from its specialisation. Monopolistic competition is an important element of New Trade Theory, it suggests that firms are often competing on branding, quality and not just simple price. It explains why countries can both export and import designer clothes. Globalisation has led to increased variety for consumers. The proliferation of brand clothing labels. Firms competing in the model of monopolistic competition and heavy branding. Neither UK or Italy has a particular comparative advantage in producing clothes, but consumers are attracted to brand image of Italian and British fashion labels. A developing economy may need tariff protection and domestic subsidy to encourage the creation of capital-intensive industries. If the industry gets support for a few years, it will be able to exploit economies of scale and then be competitive without government support. This is similar to earlier arguments surrounding infant industries. The government is likely to have poor information about which industry to support and how to go about it. New trade theory is not primarily about advocating government intervention in industry; it is more a recognition that economies of scale are a key factor in influencing the development of trade. It also suggests that free trade and laissez-faire government intervention may be much less desirable for developing economies who find themselves unable to compete with established multi-nationals. It could be argued that economies of scale and network effects are themselves a form of comparative advantage. E.g. if country X exploits economies of scale in industry Y, it then has comparative advantage in that industry. “poorer, developing economies may struggle to ever develop certain industries because they lag too far behind the economies of scale…”. That sounds to me like the well known “infant industry” idea which has been around for a very long time. What was the empirical ndings that led to the development of the new trade theory? prompted the development of new trade theory? 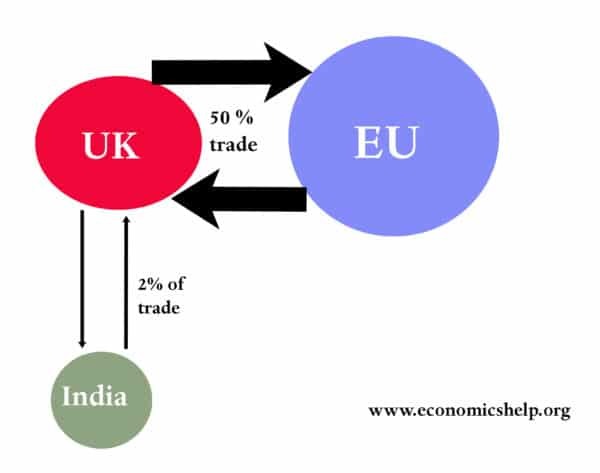 What are the sources of gains from trade in \new new trade” theory?